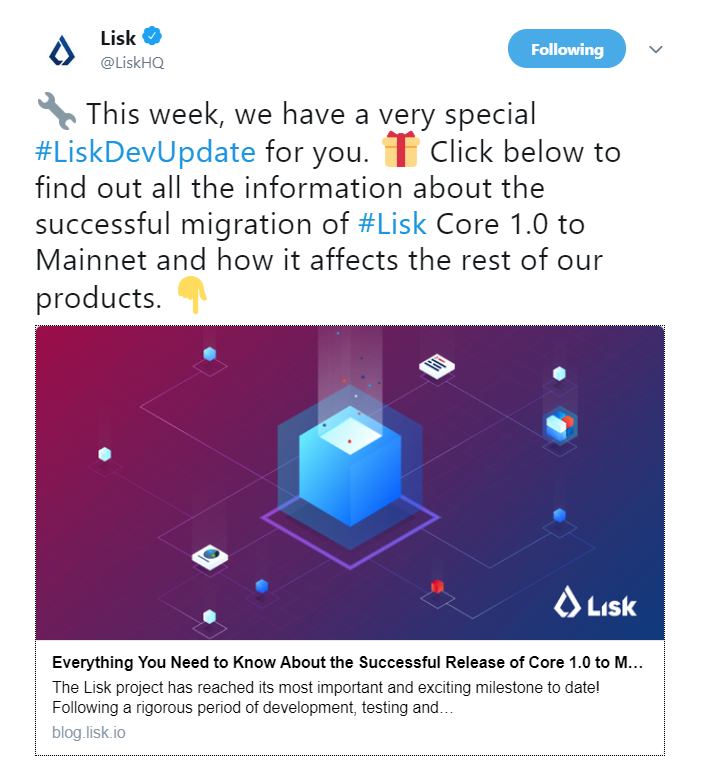 On 30th August, Lisk, on its official Twitter handle, announced the successful migration of Lisk Core 1.0 to Mainnet. The team also appears to have an exciting development update in store regarding the happenings of the past week. The Lisk Core 1.0 is now officially on Mainnet. The 101 delegates available on Lisk have been successfully migrated to the Mainnet in a period of 24 hours. Over the past week, the Lisk team released Lisk Core 1.0 compatible versions for Lisk Elements, Lisk Commander, Lisk Hub, Lisk Explorer, and Lisk Nano. According to the blog post, Lisk core 1.0 will offer several new features. The team states it has restructured the API that will enhance the performance of the core. Furthermore, the Lisk Core 1.0 comes with a new real-time Peer-to-Peer communication layer. Moreover, the core will now support a ‘fully atomic block write’ that provides data integrity across the nodes when writing to the database. The recently developed Lisk Elements 1.0 has been adjusted to suit the new Lisk Core 1.0, the blog reveals. Elaborating the new features in Lisk Elements 1.0 the blog states that the team has completely rewritten the codebase modularising it by 5 different aspects namely, constants related to Testnet and Mainnet, Cryptographic functions, mnemonic passphrase management, transaction creators for each transaction type, an API client for communication with nodes in the network. In the Lisk commander version 1.0 the team offers several new functionalities the blog mentions. The team has developed new functions that allow the user to access additional information related to the blockchain from a particular network. Elaborating further on the features of Lisk Commander 1.0 the blog states that users will be able to transact 4 types of transactions namely, transfer, register the second signature, register a delegate, vote for delegates and register a multisignature account. The Lisk team also brings forth updates on the Lisk Hub 1.0 and Lisk Hub 1.1. According to the blog, the one-stop solution Lisk Hub will offer 4 new features to the users. It will now accommodate a reference field for easy identification and distinction of transactions. Moreover, the team has improved the aesthetics of the product to enhance page usability. Adding to the above features the Lisk team has also made changes to its extended developer utility function, the network switcher, the blog explains. Furthermore, the team has in store exciting developments for the Lisk Explorer which will be released in the days to come. However, the current version is fully compatible with the Lisk Core 1.0. In addition to the above, the team has announced its plan to fully discontinue support for Nano 2.0 from January 1, 2019. Nano will only undergo security updates and no further releases will follow.